Who'd be a single parent? The Families Commission produced some research which compared one parent families with three other family types: two parent families, younger couples without children and older couples without children. Today, thirty percent of all families with children are single parent families. This high proportion is the product of forty years of state subsidisation. Any young person looking at the four groups, asked to choose which they would like to belong to 'when they grow up', is going to avoid the one-parent group. It isn't 'compassionate' to continue encouraging the single parent lifestyle. It isn't kind to the mothers or their children. Any reasonable efforts to reverse the trend should be supported without question. "There is no 'right' to help yourself to the taxes of others"
Each Friday I receive weekly e-mail newsletters from two think-tanks: The NZ Initiative and Centre for Independent Studies, Australia. Two offerings seem to dovetail this week and showed NZ in a more progressive (literal use of the word) light. Australians are impressed that John Key has persuaded NZ to accept welfare obligations (by token of his re-election) whereas their bureacrats continue to fight. They say the grass is always greener on the other side; for New Zealanders looking to Australia, it often rings true. The sun seems to shine a bit brighter there, the pay packets are a bit fatter, and they have koalas. But times are changing. The decline in long-term migration figures to Australia is just one example. And the reason is simple: Australia may have cuddly koalas, but New Zealand has John Key. When I attended a conference in Sydney last week, I was struck by the Australians’ enthusiasm for anything New Zealand in general and our re-elected government in particular. What surprised them was John Key’s apparent ability to get the public on board with his “radical” reform agenda. Radical? Really? At least on our side of the Tasman, Key hardly ever gets described in such ways. And indeed, at first glance, not a lot has changed since Key first took office. National has preserved traditional Labour policies such as state-funded education and health care, Working for Families tax credits, interest-free student loans and KiwiSaver. And as long as Key remains in office, superannuation reform is off the table. So here’s the paradox: Key’s government looks reformist from a distance but his policies do not appear to be particularly bold when looked at in New Zealand. The question is, how does Key manage the kind of blink-and-you’ll-miss-it reforms, whilst implementing some truly substantial changes to New Zealand’s policy landscape? The answer to this conundrum is that Key exemplifies the art of what one might call “radical incrementalism”. Key has a good sense for the electorate’s appetite for change. The public has to be on board– and reforms take time, patience and good explanation. That’s the real story other countries can take out of Key’s incremental radicalism. It’s not about tricking your patients into swallowing the pills, or promising false cures that won’t deliver results. It’s about educating the public on why these pills are necessary to build a strong, healthy economy. And hopefully, in time, the electorate will start demanding the pills themselves, with the knowledge a thriving economy transforms lives and living standards. This week a parliamentary committee accused the Abbott Government of violating international human rights obligations because it wants to limit the hand out of tax-payer funded welfare benefits. Welfare changes included in the May Budget set tough conditions for the payment of unemployment benefits to people under the age of 30. Failure to meet those conditions by hopeful recipients would mean no social security payments for six months. Human Rights (Parliamentary Scrutiny) Act 2011 ruled that the measure was "incompatible with the right to social security". The so-called "right to social security" is set out in Article 9 of the UN International Covenant on Economic, Social and Cultural Rights created in 1966. The Australian government signed up to the ICESCR in 1975, thereby committing to an endless, expanding provision of welfare benefits. Today, many on the Left affirm the ICESCR provision on social security because of their commitment to alleviating suffering and need. Others on the Right are skeptical because of growing public expenditure, a rising tax-burden, and the erosion of incentives to obtain employment. But the reality is that human rights - as defined by the Covenant and applied by the Parliamentary Committee in relation to welfare - is a corruption of the true meaning of the term. There is no such thing as a human right to free-flowing and unrestricted welfare. Human rights, as properly understood, grant individuals specific and important freedoms so that they can pursue their own life and well-being. These rights include the right to the freedoms of speech, religion, and conscience, as well as important rights such as the right not to be enslaved or tortured. This is to say that human rights are intended to stop governments from acting at the expense of the well-being of its citizens. They create a space for freedom to live under the rule of law. In other words, human rights stop governments from interfering in our lives. The problem with the 'right' to social security is that it sets out to alleviate a burden borne by some individuals by imposing a duty or obligation on other individuals. It is therefore not a right at all. The parliamentary committee's report criticizing the government for doing what it was elected to do is nonsense. The right to help yourself to the taxes of other people is no right at all. Peter Kurti is a Research Fellow at The Centre for Independent Studies.
" ...breathing new life into te reo"
Half of Māori who have ever been enrolled in both kōhanga reo and kura kaupapa can speak te reo Māori well or very well, Statistics New Zealand said today. This surprised me because I thought te reo speakers weren't increasing in number. The 2001 census showed around 28.2 percent of the Maori population are te reo speakers. By 2013 the percentage had dropped to around 23.7%. The above statement though is based on a different data source, Te Kupenga. Amongst the younger groups the survey responses exceed the census. The reverse applies amongst the older age groups. Alignment between responses from the 2013 Census and Te Kupenga, and the 2001 Census and the 2001 HMLS is not perfect. For example, 16.1 percent (4,000) of Māori who reported speaking te reo Māori very well in Te Kupenga had stated in the 2013 Census that they could not hold a conversation about a lot of everyday things in te reo Māori. At the other end of the scale, 4.1 percent (9,500) of Māori who reported speaking no more than a few words or phrases of te reo in Te Kupenga had stated in the 2013 Census that they could hold a conversation in Māori. 1. These proportions exclude responses that cannot be classified (eg ‘not stated’, ‘response unidentifiable’, and ‘response out of scope’). But I think the headline we started with is perhaps optimistic. 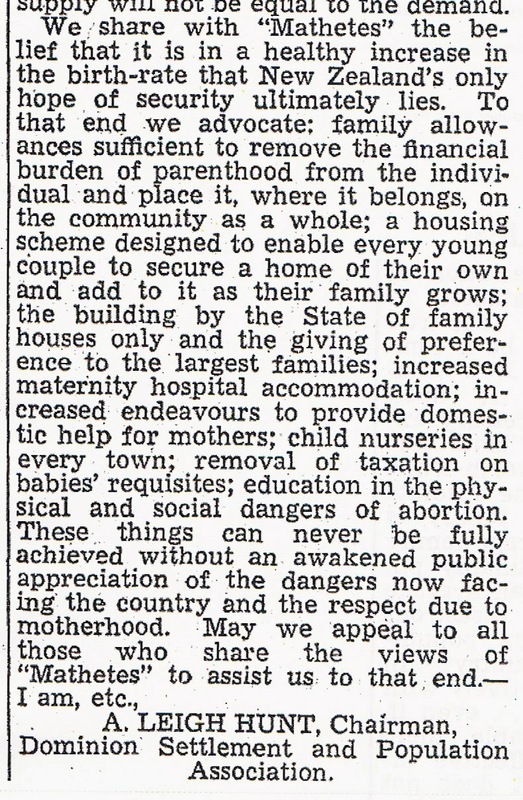 Bar the abortion advice, plenty of parallels with today's advocacy and practise. Funny thing is, the greater responsibility the 'community' has assumed, the smaller families have become. The more things change, the more they stay the same. The truth of that becomes increasingly obvious the longer one lives. Many issues are perennial. From time to time I enjoy a trawl through an old newspaper. Many are now available on-line. So I thought I'd start a new posting habit of demonstrating the above maxim. 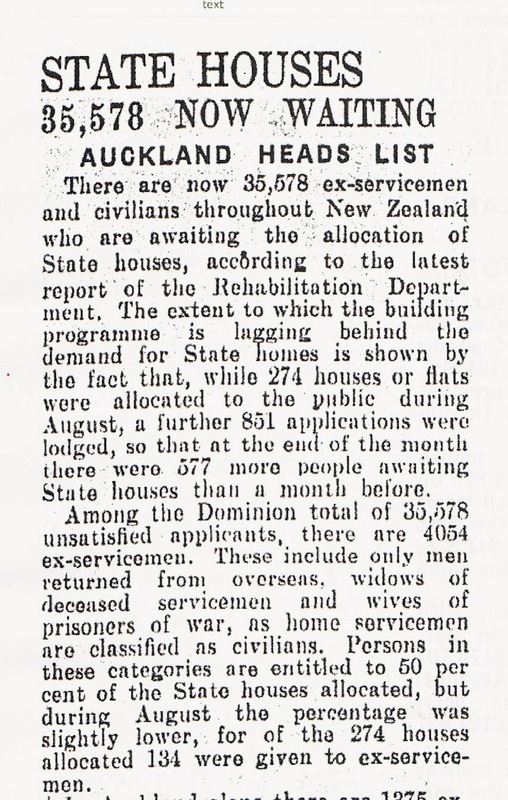 At Papers Past historic newspapers up to 1946 are available. So I chose a revisit date of 70 years ago today. Housing waiting lists are never out of the news and make excellent political fodder. Currently there are 5,840 applications awaiting fulfilment nationally. It is important to me that I leave my personal brand, which is reasonably statesman-like, and I'm not into any form of gutter politics. Never, ever describe yourself as "statesman-like." It isn't a matter of veracity. It's a matter of humility. He has none. Will Mallard hold my electorate? I have been musing since election day that while I might have 'wasted' my party vote on ACT it was an acknowledged gamble. My electorate vote might yet prove useful if Trevor Mallard ends up losing the seat. While I gambled with my votes, 2693 other voters simply threw theirs straight down the dunnie by giving their electorate vote to Green candidate Holly Walker who had stated prior to the election SHE WOULD NOT RETURN TO PARLIAMENT. What were they thinking? Were they thinking? I am assuming that most were two ticks Green voters wanting a change of government. In which case, surely the best option was to split their votes between the Greens and Labour? Had more of them voted tactically Mallard wouldn't now be sitting on a knife edge. It was a nail-biting night for Trevor Mallard, but he's holding on to his Hutt South seat for now. The Labour veteran is ahead of National's Chris Bishop by just a few hundred votes, with more than 3000 special votes still to be counted. At the risk of being flippant, lucky for them one of the numbers was increasing. Otherwise their narrative would be spoiled. Avoiding sanctions - how hard can it be? Who will replace Paula Bennett?